Seventeen years ago, id Software unleashed an update to the Castle Wolfenstein series, which took the franchise from obscurity to a PC household name when it launched in 3D. 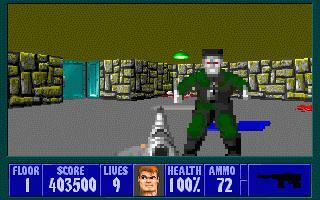 The game is credited for launching the origins of the first-person shooter, which went on to ignite the red-hot genre when id followed up with a game known as Doom. A lot has changed since my father and I would scour the Shareware racks at the local store for Wolfenstein content as the newest resurgence of the series brings the original six Wolfenstein 3D episodes to the Xbox 360 via a $5 download. In an effort to promote the next true game in the Wolfenstein lineage on the system, id and Nerve has teamed up to faithfully bring B.J. Blazkowicz back into the spotlight. With the game being released 100 percent as it was in 1992, will Wolfenstein capture players once again or will its simple origins be lost among the shuffle of today’s FPS offerings? As was common back during its time, Wolfenstein 3D doesn’t throw significant story lines at the player directly in the game – instead, the instruction manual provided players with a story premise and players were directly launched into the game right from the start. Wolfenstein actually works as episodic content, of which the Xbox 360 download provides players with the six episodes prior to B.J.’s search for the Spear of Destiny. The first episode is detailed in the instructions, with B.J. being captured by Nazi forces while on a reconnaissance mission. Instead of waiting around to die, he lures a guard into his cell, kills him and brandishes his pistol to begin his grand escape from Wolfenstein’s prison. When players launch the game, sure enough, B.J. stands with his pistol ready over a dead guard and by beating episode one, the ending details the storyline for the next episode and this is repeated for each episode. Certainly, the storytelling is as simplistic as it gets, but the World War II motif mixed in with chemical warfare give it a flair of reality and while it serves its purpose, it fails to do anything more. 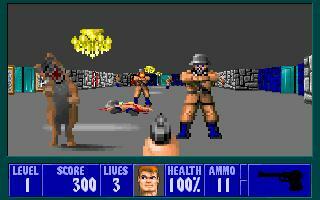 Wolfenstein contains six episodes with 10 levels in each, providing players with 60 stages to tackle with the option to choose from four varying levels of difficulty. Sixty levels isn’t too shabby for a mere 400 Microsoft Points but players will have to know coming in that this is absolutely all they will receive with the purchase. 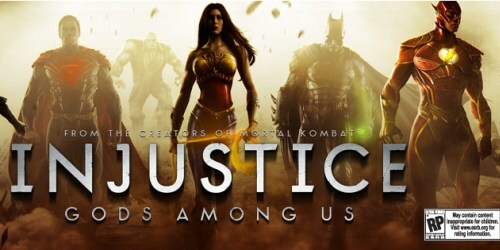 There is no multiplayer, no online functionality sans leaderboards and when all 60 levels are tackled, there is very little reason to come back to the title unless players want a few more achievements, want to tackle an episode at a higher difficulty or perhaps the truly insane won’t be satisfied until they uncover 100 percent of every single stage. Being a faithful reproduction of the original title, players will also have to expect 1992 quality from the title. The graphics and animation were very impressive for the time as id took gameplay into a 3D world, but players today will easily be able to count every pixel on an object when it is up close. 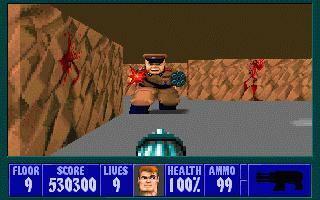 Wolfenstein also has very little variety in its environments with endless brick walls and the same three or so objects hanging around in the environment. The menus serve as the only new visuals and while the blood red color and film grain are nice, fitting touches, the presentation outside of the game play is extremely generic text. For its time, the game was certainly an accomplishment, but in 2009, it is clearly evident the game hasn’t aged well and while you can’t fault a 17-year-old game for looking like it is 17 years old, graphics junkies will definitely be turned off by Wolfenstein’s appearance. The sound effects and music also get ripped from the past, allowing me relive the glory days when Sound Blaster was king. Wolfenstein recycles many of the same level tunes throughout the course of the game and for its time, the tunes were fairly lively (but repetitive), however, on the Xbox 360, the muffled tunes hardly shine with quality. While the music isn’t necessarily bad, it will easily get lost among the action as the sound effects really steal the show in Wolfenstein. Each of the three firearms sound as they should, the doors eerily echo throughout the halls when they open and close and the calls of the enemies are just as memorable as they were in the “Ëœ90s. 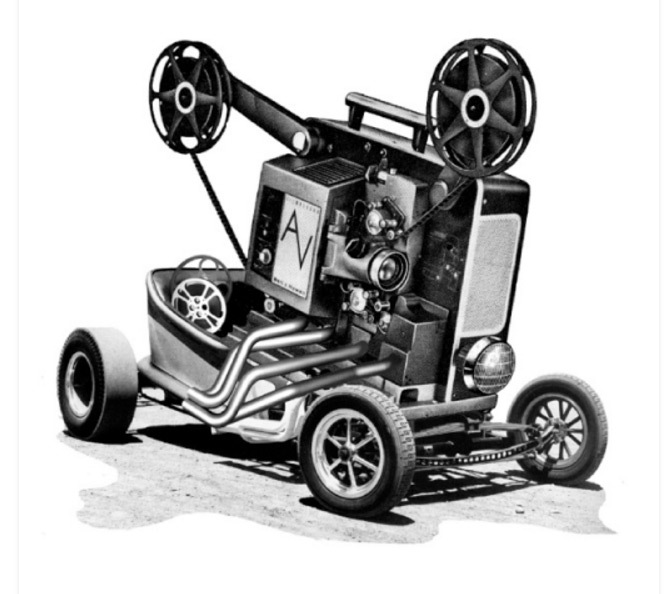 The voice effects aren’t by any means produced with crystal clarity and when you hear “Achtung!”Â for the fiftieth time in a level, you might go a little batty, but, overall, the sound more than does its job. Seeing as Wolfenstein is the OG of the FPS genre, it’s no surprise the title comes across as very simplistic. With only four total weapons available to players, a handful of enemies and a few navigation options, the control scheme is easily mapped to the Xbox 360 controller. The dual analog movement allows players to move with ease, the right trigger is a comfortable home for firing shots and the face buttons perform other simplistic actions such as opening doors and switching weapons. While the simplicity makes for great control without overloading the controller with actions, the simplicity also grates away at the game play, especially with the amount of options today’s players are used to. Gameplay-wise, Wolfenstein executes the way anyone would expect an FPS to – you run around environments and shoot anything that moves. This works great in Wolfenstein 3D, however, there are a few knacks that can potentially annoy players. There are no in-game maps, making Wolfenstein a true test of adventure, harking back to the days of dedicated players drawing their own maps and sharing with others. However, with such little variety in the environments, players can waste a lot of time running through empty corridors in search of a key or locked door in order to reach the elevator to the next level. Also, there are a few collision detection issues involving doors and corners when it comes to gun fighting. Players and enemies can shoot through doors the second they are opened and any player not in the know will no doubt be miffed when they take a bullet from an obstructed soldier hidden behind a half-opened door. Again, players have this same privilege, so it’s just a matter of being in the know, however, it’s just plain annoying getting shot through a metal door. Overall, though, Wolfenstein is a test of patience as, while it plays well, it quickly becomes the definition of repetitive by the time players reach the fourth or fifth level in an episode. 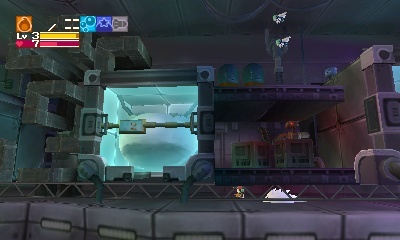 Levels become fetch quests for keys as players battle the same two or three enemies ad infinitum while navigating endless grey (sometimes red, blue or brown) corridors. The definite highlights of each episode are on the ninth floor as players battle ridiculous, larger-than-life boss characters equipped with brutal weaponry, but even these battles are very short. The bottom line here is if players love to explore, there is a lot to love in Wolfenstein, but players looking for a no-frills straight shooter experience might head to a different game once they get lost in the game’s tight, winding corridors. If you were a fan during Wolfenstein 3D’s first run, you’ll be right at home with this release. While the game runs just as it was intended in 1992, I found it odd that when players unveil a secret area, the game jogs for a split second – a minor qualm, but purists might find the slight hesitation a tad annoying. Even though I thoroughly enjoy this re-release, there are a few crippling issues with the game play and the lack of expansive weaponry, replayability and actions might be a hard sell to the FPS fans of today. Even at $5, Wolfenstein is best served to those who were around to experience it the first time, but anyone who is curious in exploring the origins of the FPS genre might still get some decent mileage out of the title. As a direct port-over, Wolfenstien 3D for the Xbox LIVE Arcade is as perfect as it gets, making it one of the definitive ways to currently own a pound-for-pound production of the original. 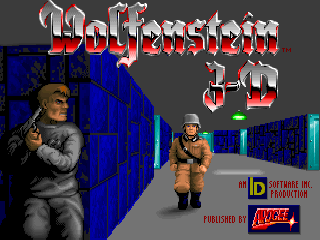 Based on the game’s technical merits and 1992 production date, Wolfenstein 3D was an impressive romp through Nazi strongholds and laid down the basis for the FPS genre. 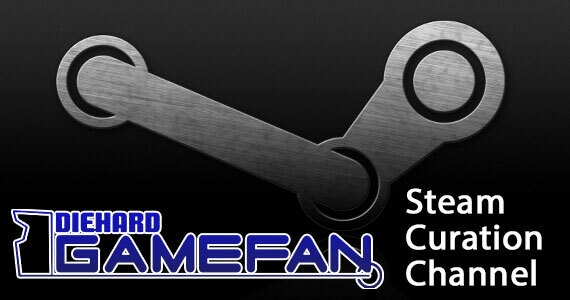 In today’s world, though, some technical setbacks, extremely repetitive nature and lack of replayability won’t go overlooked by today’s FPS fan. Wolfenstein 3D is best reserved for the PC hounds that lived through the eyes of B.J. Blazkowicz the first time around, but it’s not to say gamers new to the franchise won’t enjoy a bit of the game. The title still holds up after 17 years, but it’s going to have some trouble capturing the long-span attention of today’s players spoiled by explosions, open-world game play, destructible environments and online multiplayer.